Standard mattresses vary in thickness from 7” to 24”. Older mattresses are thinner while newer pillowtop mattresses are thicker. A 15” overhang would be fine on a bed with an older mattress. However, it would not work as well for a bed with a pillowtop mattress as it would leave about half of the mattress height exposed. 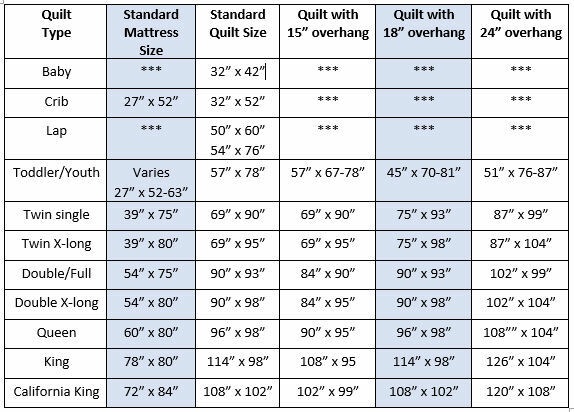 When calculating length, take into consideration the distance needed to cover the height of the bed pillows if you wish your quilt to cover the pillows rather than lay under them. About 12 inches is the average except on a toddler bed, where you only need about 4 inches.